My past is littered with the bones of men who were foolish enough to think I was someone they could sleep on. Man, what a quote that is. Wouldn’t it feel fantastic to be enough of a badass to say that with a straight face? The person who actually did? 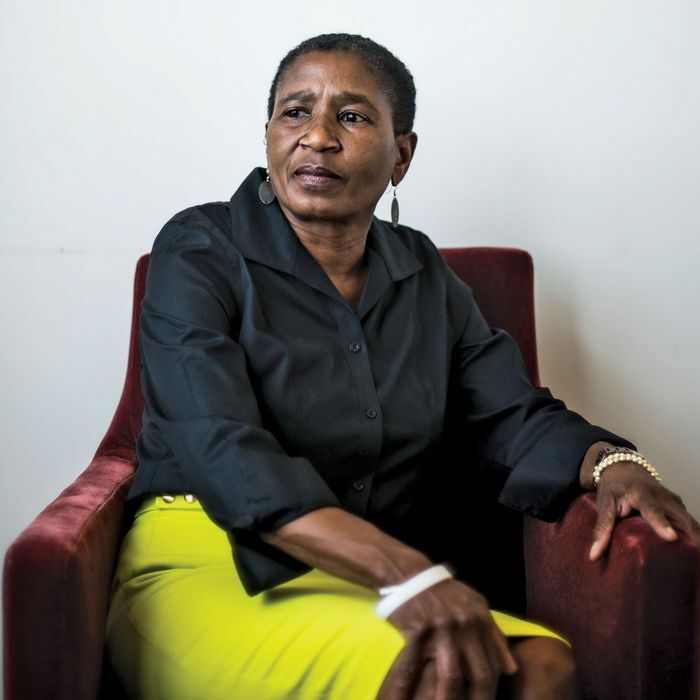 An incredible woman named Michele Roberts, a longtime attorney called, by Washingtonian magazine, “the finest pure trial lawyer in Washington.” Now she is setting her sights on the insular, complacent, owner-friendly world of sports as the new head of the National Basketball Players Association. If you’re looking for the one person most likely to alter the world of sports most dramatically over the next decade, it’s not LeBron James or Roger Goodell. It’s this 58-year-old woman sitting in her office in Harlem, ready to watch the sports world burn. We’re more than three years away from the earliest point the current NBA collective-bargaining agreement could end, so it was surprising to see the new NBA commissioner, Adam Silver, still with a bit of a halo from the way he handled Donald Sterling, release an angry statement on November 13 about a players-union chief. He had to punch back, fast, because Roberts had come out and, in one of her first interviews since getting the job (with ESPN’s Pablo S. Torre), exploded some of the primary myths surrounding the economics of professional sports — the ones that shield owners from public scrutiny as they extract as much value from the fragile bodies of the athletes they employ before those bodies break down. Let’s back up. The world of sports has long existed outside economic realities the rest of us have to deal with. In almost every way, the deck is stacked in favor of the owners. Shady relationships with politicians and developers means teams get billion-dollar stadiums built largely on the public dime; antitrust protections shield leagues with labor practices unheard of in other industries; insane television contracts mean teams are sold at ten times the profit even as owners are constantly crying poor. As an owner, you can’t lose. The reason you have had lunatics for owners like Daniel Snyder and Jerry Jones and James Dolan — men whose business acumen is far exceeded by their bizarre eccentricities and public doltishness — is that it is nearly impossible not to get rich owning a sports team. It’s the cushiest job in America. The thing about all of these statements is that they are inherently reasonable, and yet they threatened to expose the whole rhetorical edifice of pro sports as a mere alibi for owner greed. The dirty secret of the past two decades of sports labor peace is that almost all of it is the result of player concessions. Sports labor unions have long been among the most powerful unions in the U.S., but even they’ve suffered in the wake of unions’ collective national erosion. In Major League Baseball, the players’ share of revenue has fallen nearly 20 percent in the past 20 years despite that figure jumping from $1.2 billion to $8 billion. In the NFL, it’s down to 47 percent from 50; in the NBA, to around 50 from 57. And remember, those growing owners’ shares are of massively booming revenue. There are a number of reasons for this decline — paranoia over performance-enhancing drugs, “disciplinary procedures” that leagues use as a cudgel against players — but the primary one is that union reps in sports have become far less pugnacious than they used to be. Gone are the days of ­Donald Fehr going toe-to-toe with Bud Selig in the name of Marvin Miller. Today, the prevailing wisdom seems to be, “Hey, there’s so much money to be made … why mess with a great thing?” And while that’s true — sports have never been a more valuable property than right now — that “don’t mess with a good thing” seems to benefit the owners in every case. It’s always the players being asked not to kill the golden goose. It’s clear now that Roberts is leading with a machete. Because, as commonsensical as her views might seem to those with something other than a professional involvement in sports, they’re downright radical to those inside the sports world; to Silver, she might as well be a columnist for The Nation. In the Torre interview, Roberts dropped another bomb: “No one wants to say it out loud, but [the NBA is] a monopoly. And were there alternatives, they wouldn’t get away with it.” That’s an obvious statement of fact, and yet, in this context, it is a threat. For years, progressive activists and observers have argued that players — the ones actually producing the product — could do just fine on their own. This seemed especially the case with basketball players, who are so heavily marketed: Given his value to the Cleveland Cavaliers, LeBron James’s maximum allowable salary may well underpay him by tens of millions or more. No one has ever suggested crossing a Rubicon so blithely. Roberts did it in her first few months on the job. Sports leagues have argued for a century that they deserve special treatment, that they’re “different” from other for-profit corporations and don’t need to be treated with the same skepticism or regulation. (That great line from North Dallas Forty comes to mind: “Every time I try to call it a business, you say it’s a game. And every time I say it should be a game, you call it a business.”) If leagues were to lose that special status, or if someone from the outside truly challenged them on it, the entire structure might implode. Imagine how a player-centric league might work. Think beyond just a higher revenue split. Think players being able to go wherever they like, rather than being “drafted” by a city they don’t know at a cost below market value. Think players having true autonomy over how they peddle their wares. Think truly competitive alternative leagues, a world where Jim Dolan actually has to sell his product rather than simply profit from family ties. Of course, there would be downsides: You could end up with a barnstorming Nike team playing a barn­storming Adidas team, and three-­quarters of games would be played in Vegas. But it would be far more fair to the players than the current system. And, well, American: After all, the players are who we’re paying to see. Of course, the challenge was bound to come, as revenues reach record levels and unions grow weaker. There’s also been a loosening in public opinion; whereas in the past leagues could count on a prevailing “The players are millionaires anyway, what do they have to complain about?” sentiment, the world of sports has become more progressive as the rest of the country has turned in the other direction. No one begrudges LeBron his money. (Even Forbes has argued he’s underpaid.) Plus, the entire sports conversation, whether it’s Ray Rice or Adrian Peterson or Donald Sterling, is now driven by outsiders. And the more that outsiders take a look at the business of sports, the more skewed against labor it appears. Roberts’s muscular approach clearly took Silver aback, and why wouldn’t it? She’s the one who will be sitting across the table from him. Which means Silver best keep an eye on his bones.